Four of our people have completed a gruelling nautical and cross country relay challenge to raise money for NSPCC. 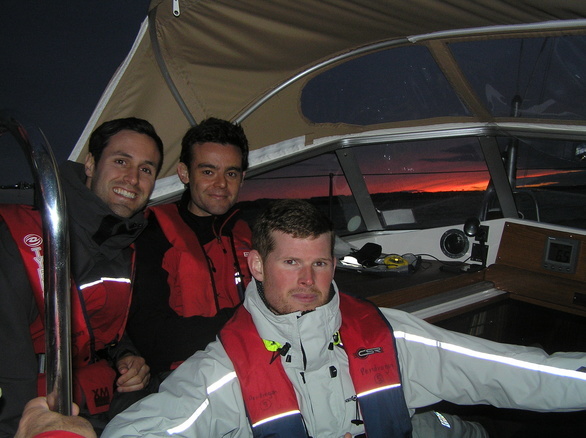 Partner, Rob Langley, captained the team in his 37ft sailing yacht Pendragon, while solicitor Adam Aston, and trainee solicitors Daniel Graham and Mark Reeves, completed the cross country legs of the Castles and Islands Challenge. The team ran approximately 30 miles and sailed 64 miles around the Northumberland countryside and coast in the race organised by the Coquet Yacht Club based at Amble. The first leg was a ten mile run from Alnwick Castle to Amble via Warkworth Castle. At Amble the teams boarded their boats and raced to Seahouses, Holy Island and Low Newton, via Inner Sound and Staple Sound on the Farne Islands. They took it in turns to sleep on board the boat, with some legs of the race completed in the dark. There were rough seas to contend with approaching Seahouses, late on Friday night, and dangerous tidal currents and standing waves in among the Farne Islands. Further cross country runs took place, with teams rowing ashore to race four miles from Low Newton to Dunstanburgh Castle, six-and-a-half miles from Seahouses to Bamburgh, and approximately nine miles around Holy Island. Adam, Daniel and Mark are all keen runners who take part in the Newcastle-based law firm’s Thursday night running club. They took it in turns to complete the cross country legs of the challenge, whilst Rob remained onboard to captain the ship, with a first mate and deckhand, who kept the team fed and watered throughout. Daniel said: “We are all absolutely delighted to complete the challenge within the 24 hour time limit. Conditions were testing. Rough seas meant we couldn’t get to shore to do the Seahouses run as we planned, so we had to sail up to Holy Island and do that run at 04.30am, which was quite a surreal experience. This also meant that some of the guys had to do three runs in very quick succession, which didn’t help our legs. Rob Langley added: “Supporting charities that make a difference in our local community is at the heart of our commitment to fundraising. We asked our people which charity they wanted to support and we’re delighted that they chose the North East branch of NSPCC. Muckle LLP has built a strong reputation for corporate social responsibility over many years and this year won the Heart of the Community award for Tyneside and Northumberland in the North East Business Awards. The money it raises this year will go towards NSPCC services that help children, young people and their families in the North East. These include local services delivered from the NSPCC’s service centre in Newcastle and ChildLine, the 24 hour helpline for children and young people. For more information on our charity work and other community activities please visit our being a responsible business page. Alternatively, call us on 0191 211 7777 and speak to the team today.